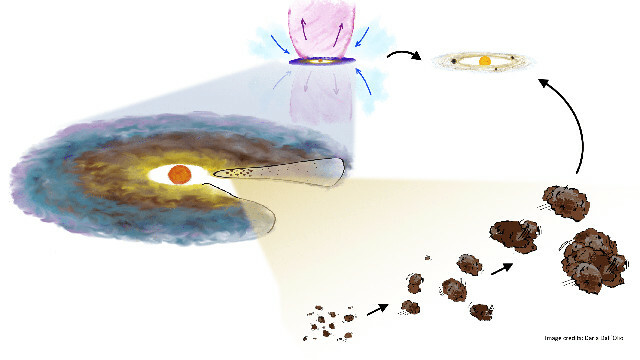 An article published in the journal “Nature Astronomy” describes the discovery that dust particles in a disk surrounding a protostar start coagulating even before the star has completed its formation. A team of researchers used the ALMA radio telescope to study the system in formation TMC1A noting the lack of radiation from carbon monoxide near the protostar. Their conclusion is that large dust particles are blocking those radiations, an important discovery because it means that in the disk of gas and dust the processes that will lead to the formation of planets have already begun. Approximately 457 light years from Earth and with a mass that’s about half the Sun’s, the protostar TMC1A and its protoplanetary disk were born in the molecular cloud of Taurus about 100,000 years ago. This is an area of ​​notable star formation. The relative proximity in astronomical terms makes it an interesting object of study and TMC1A was already studied with the ALMA (Atacama Large Millimeter/submillimeter Array) radio telescope, inaugurated in March 2013, in a previous research published in December 2016 in the journal “Nature” . The ALMA radio telescope is making it possible to study a number of star systems in formation thanks to its power and its sensitivity, providing all the time new information on the birth of stars and planets. In the case of TMC1A, there’s a protostar that’s still forming and a protoplanetary disk in which the researchers expected to find carbon monoxide, a compound common in molecular clouds, instead in the area around the protostar they didn’t detect it. In the top image (Jørgensen/Harsono/ESASky/ESAC [CC-BY-SA 3.0]), the TMC1A system is observed with areas in red containing a lot of dust particles while green and blue indicate the presence of two different types of carbon monoxide. In the inner area, for a radius about 15 times the distance between the Earth and the Sun, those emissions are absent. The explanation given by the researchers to that anomalous situation is that the “signature” of carbon monoxide in the emissions from the internal area of ​​the TMC1A system is blocked by large dust particles. We’re talking about particles that could have a diameter of one millimeter but they’re still a thousand times larger than what’s expected to find in that phase of a star system’s formation. The researchers tried to create computer simulations based on the collected data and they confirmed the hypothesis that the dust particles have already started coagulating as indicated in the artist’s illustration in the bottom image (Daria Dall’Olio [CC-BY-SA 3.0]). This can coincide with a mass of gas and dust large enough to form giant planets after a few million years. Daniel Harsono of the Dutch University of Leiden, who led this research, explained that the protostar is only half to three quarters of its final mass and yet the process of planetary formation has already begun and this is surprising. Matthijs van der Wiel of ASTRON, the Netherlands Institute for Radio Astronomy, another of the authors of the research, is satisfied with the result but specifies that the premature growth of particles in the TMC1A system could be an exception. In short, the discovery is really interesting but it’s necessary to understand whether it’s a normal event or the TMC1A system is somehow out of the ordinary. For this reason, the researchers intend to study other protostars to verify if planetary formation processes have already started in them as well.